Are you planning to take your first step towards the app ui design? Struggling to come up with a mind blowing design pretty fast? Cut down your designing efforts and pick the smart solution! 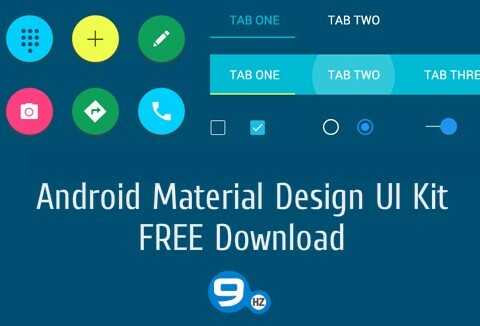 Today's freebie brings you an Android app UI design kit to help you with your app design. It will get your app framework ready in no time. Grab this UI material design kit for FREE! With the release of latest Android, “material design” has become a quite trending concept and designers have started to use it in their applications. The app UI design PSD is created in a very efficient way with layered structure so that it can be edited and customized according to your project need. It contains a lot of UI components with a great color combination and design styles which can also become more attractive by your creative design skills and ideas. If you have a little Photoshop skills, you can easily design your next Android app by using this material design PSD. You can use these PSD designs for your personal and commercial use. The ZIP file contains .psd format. You can also alter PSD files to create your own design. You cannot sell this package on other websites or claim them as your own work. Navigation bar & much more. In 2014, Catherine Clifford from Entrepreneur Magazine predicted that the mobile app market would raise to be a $77 billion dollar industry by 2017. Getting into mobile app market has never been this appealing, and mobile app developer jobs are some of the most sought after. When designing mobile apps, a lot of the thought process goes into the two big aspects — UI and UX. The bread and butter for any mobile app today. Grab this App UI design kit for free today!